We've been looking at houses for awhile now and can't seem to find anything we can afford that wouldn't require massive amounts of renovation money. This week our realtor called to let us know a house had just been reduced to close to our price range and we should go look at it. So, Friday night we did and I swear it was like walking into my childhood home! Other than the fact that it was a mirror image and the kitchen and dining room were switched it is eerily similar! And other than the fact that it's a ways out of town it's actually a "normal" house compared to some we've looked at! Consider the following: before we made an offer on this house there was one more we wanted to look at. It was in a community much closer to my parent's and that would have been nice. However, the following pictures will give you some small idea as to why we didn't stay more than 10 minutes in the house today. Downstairs the main living and dining room were pretty decent, but the kitchen... oh.my.word. I'm not sure you could even fit a small cookie sheet inside of it! Also notice the fabulous wall paper! There were a couple of the original cabinets on the walls and the rest were just sitting there unattached. Someone was planning on replacing them because off in a closed in porch area (very poorly done) were a bunch of raw cabinets sitting along the wall. The list could go on, but our agent didn't even think we could get financing on this house... and my dad suggested it just needed a bulldozer! Needless to say, this made the normal house look pretty good! We wrote up all the paperwork this afternoon so now we're just sitting on pins and needles, with our toes crossed. Or something like that! What do you mean? 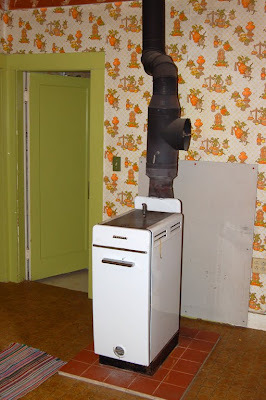 You didn't like the wood stove? 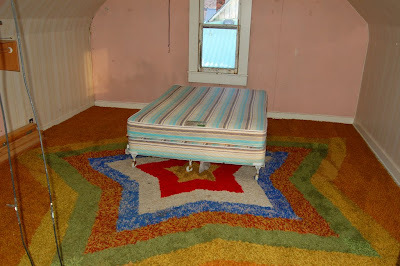 I think it could easily burn that carpet off the bedroom floor, and voila! Problem solved! WOW!!!!! I didn't know-- can't wait to hear-- so exciting!! Good luck with the house hunting. I know how stressful it can be at times. But don't give up. Ummm.....I agree with your dad about that house! It just needs a bulldozer! I want to know how much they were trying to sell it for. I remember how exciting/frustrating/nauseating the house hunt can be....wishing you lots of luck!! That oven is hilarious! Good luck on getting the new house!